The North American results of the 39-country 2013 Pew Research Center survey are a tale of one continent but two distinct public moods. By almost every measure, publics in Canada and the United States see the world they are experiencing through different lenses. Canadians are generally happier with their economic lives, although the U.S. public is more optimistic about the future. More than half of the Canadians (55%) surveyed are satisfied with the way things are going in Canada today. About a third of the public in the United States (31%) is pleased with the direction their country is taking. Two-thirds of Canadians (67%) say their economy is good. Only a third of people in the United States agree. Canadians and the U.S. public also see their personal finances in different lights. Fully 82% of Canadians say they are doing well personally versus 67% of those surveyed in the United States. However, the U.S. public is more optimistic about national economic conditions: 44% think they will improve over the next 12 months, compared with 29% in Canada. And people in the United States are more upbeat about their personal finances over the next year: 43% believe they will improve versus 34% in Canada. Canadians and their U.S. cousins see more eye-to-eye on the economic future for children in their societies. But that future is not expected to be good. Only a third of the U.S. public and about a quarter of the Canadian public think children will be better off than their parents. The U.S. public is more worried than Canadians about all sorts of economic problems. By 51% to 38%, people in the United States fret more about inflation; by 58% to 37%, they complain more about unemployment; and by 61% to 40%, they feel public debt is a major issue. In all three cases, economic statistics suggest the problem is worse in the United States. Less than half in the United States (47%) and Canada (45%) say the gap between the rich and the poor is a very big problem, among the lowest levels of concern in the current survey. But 66% of the U.S. public and 76% of Canadians think inequality has gotten worse in the past five years. And 61% of people in the United States and 58% of Canadians think that the current economic system favors the wealthy. In a possible commentary on the differences in the social welfare systems in Canada and the United States, just 9% of Canadians say that there have been times in the past year when they did not have enough money to buy food for their families, compared with 24% of Americans. Similarly, only 11% of Canadians report that there were occasions in the past 12 months when they could not afford health or medical care for their family. Nearly three times as many people in the United States (31%) faced that problem. Similarly, 11% of Canadians complain they did not have the funds to buy clothing for their family in the past year, while 27% of the U.S. public faced that problem. Among the six geographic regions surveyed, the Europeans are the most dissatisfied with the direction of their country and the most upset about current economic conditions. A median of just 19% of Europeans are happy with how things are going in their nations, with the Germans (57%) the only public where a majority is satisfied. And a median of only 15% of Europeans think their economies are in good shape. The Germans (75%) are again the most content, with the Greeks (1%), the Italians (3%) and the Spanish (4%) the least likely to think economic conditions are good. Europeans (a median of 19%) are also the least likely among the regions surveyed to think their economy will improve over the next 12 months. 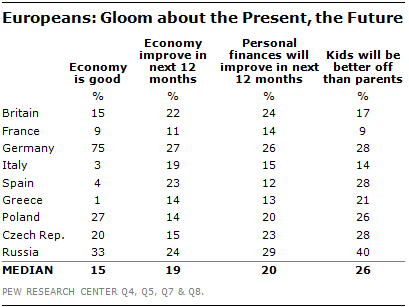 The French are the gloomiest; just 11% think things will get better. The Germans are the most optimistic, but still only 27% expect economic conditions to improve. Europeans are slightly more upbeat about their personal finances. Roughly half (a median of 51%) say their personal economic situation is good. And this includes 77% of the Germans and 65% of the British. But a median of only 20% of Europeans think that their personal finances will improve over the next year, making them the least optimistic public in any region surveyed. There is also little confidence in Europe about the economic prospects for children in their societies. A median of just 26% believe that kids today in their country will grow up to be better off financially than their parents. Just 9% of the French see a brighter future for children. The most optimistic for the next generation are the Russians: 40% say children will do better than their parents. In their sixth year of economic crisis, Europeans are beset with problems. A median of 75% complain that a lack of employment opportunities is a very big problem. This includes 99% of Greeks, whose unemployment rate was 27.0% in February 2013, and 97% of Italians, whose jobless rate was 11.5% in March. The least worried about unemployment are the Germans (28%). A median of 70% of Europeans are very worried about public debt. This includes 92% of Greeks, whose national debt in 2012 was 156.9% of the gross national product. Notably, the Russians (39%) and the Germans (37%) are the least troubled by public debt. Majorities in most countries say inflation is a very big problem, a sentiment that corresponds with relatively low inflation rates in most nations. Again the Greeks (94%) are the most concerned and the Germans (31%) the least troubled. A median of nearly six-in-ten (59%) Europeans think the gap between the rich and the poor is a very big economic problem. The least concerned are the British (50%), and the most concerned are the Greeks (84%). Europeans (median of 82%) are the most likely among the regional populations surveyed to think that inequality has grown over the past five years. Nearly nine-in-ten Spanish (90%), Germans (88%), Italians (88%) and Greeks (88%) think that income and wealth disparities have worsened. It is little wonder then that a median of nearly eight-in-ten Europeans (78%) believe that the current economic system favors the wealthy. Their concern about inequality notwithstanding, by an overwhelming margin Europeans (a median of 52%) think their governments’ first priority should be to create more jobs. Despite the severity and prolonged nature of the euro crisis, Europeans report experiencing less economic deprivation than people in most other regions of the world, possibly thanks to the strength of the European social safety net. A median of just 23% of Europeans say they did not have enough money to buy clothing for their family at some point in the past year. Only 17% report they lacked the funds to pay for needed medical and health care. And 16% complain they did not have enough money to buy food that their family needed. The levels of deprivation across the board were highest in Greece and second highest in Russia. The Middle East is marked by great diversity in public opinion across a range of economic issues, with Turks and Israelis generally the most satisfied and Lebanese the least. A median of just 30% among the seven countries surveyed in the region are happy with the direction of their country today, but this ranges from a low of 11% in Lebanon to 51% in Turkey. Even fewer (median of 23%) are satisfied with the state of their economy, again with the Lebanese (10%) and the Turks (53%) defining the range of views. A median of just 28% think their economy will improve over the next 12 months, with the Tunisians (50%) the most optimistic. People in the region are slightly more pleased with their personal finances; a median of 42% say they are good. But this is the lowest regional satisfaction in the 39-country survey. The Israelis (59%) are the most happy with their personal economic situation, the Egyptians (21%) the least pleased. A median of 32% think their family finances will improve over the next year, with the Tunisians (48%) the most optimistic. 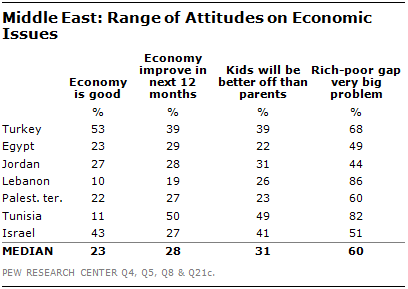 Publics in the Middle East are particularly gloomy about the economic prospects for the next generation. A median of just 31% think children today will be better off financially than their parents. Only the Europeans (26%) and North Americans (30%) are as pessimistic. The Egyptians (22%) have the least hope for kids in their society, along with the Palestinians (23%). As in other regions, Middle Eastern publics (median of 73%) are highly concerned about the lack of employment opportunities, especially the Lebanese (91%) and the Tunisians (90%). Nearly as many people (median of 72%) complain about inflation, particularly the Lebanese (92%) and Tunisians (90%). Slightly fewer (median of 63%) say public debt is a very big economic problem. When asked what they think should be the government’s top priority in fixing the economy, a median of 31% say taming inflation while 27% name creating jobs. A median of fully 60% of publics in the region think the growing gap between the rich and the poor is a very big problem and 71% believe that such inequality has grown over the past half decade. The Lebanese (86%) and Tunisians (82%) are the most concerned. And across the region a median of 70% complain that the present economic system generally favors the wealthy. Medians of more than three-in-ten of the region’s publics say that there have been times in the past 12 months when they could not afford to buy clothing or pay for health care for their family. And 27% report that they have had trouble putting food on the table. The Egyptians have had a particularly tough time: 57% say they have had trouble paying for clothing in the past year, 48% say they could not afford medical care, and 36% complain about not having enough money to buy food that their family needed in the past 12 months. In the Asian/Pacific region, many publics are happy about the state of their national and family finances, optimistic about the economic prospects for the next generation and relatively untroubled by inequality. But given the range of countries in the survey of the region – advanced economies such as Australia, Japan and South Korea; emerging market countries such as China, Indonesia and Malaysia; and developing nations such as Pakistan and the Philippines – there is a wide diversity of views on almost every topic. A median of just 39% of publics in the region is satisfied with the way things are going in their country. But 52% think their national economy is doing well. The Chinese (88%) are the most pleased with current economic conditions. And well they should be — their economy grew by 7.8% in 2012, according to the International Monetary Fund, more than twice as fast as the world as a whole. The Pakistanis (17%) are the least satisfied, despite the fact that their economy grew by 3.7% last year. The Chinese (80%) are also the most optimistic about their economy improving over the next year, and Pakistanis (26%) the least hopeful. The Australians are among the most satisfied with their economy (67% good) – a plurality (41%) expects conditions to stay the same over the next year while 31% think things will improve. Among the six regions surveyed, people in the Asian/Pacific region are among the most pleased with their personal financial situation: 63% say their family finances are good. Malaysians (82%), Australians (77%) and Filipinos (76%) are particularly pleased. However, a minority of Koreans (40%) and Japanese (38%) think their personal economic situation is good. When asked whether they think that when today’s children grow up they will be better off than their parents, a median of 57% in the Asian/Pacific region say the next generation will do better financially, making people in the region some of the most upbeat of the regional publics in the survey. In fact, majorities in five of the eight nations in the Asian/Pacific region think children will be more economically successful than their parents. Nevertheless, there were wide disparities in views. Roughly eight-in-ten Chinese (82%) think kids will do better than this generation, but only 15% of Japanese agree. Despite their general satisfaction with the economy, publics in the Asian/Pacific region do have significant economic concerns. Yet they are among the least worried of the regional publics about both jobs and inequality. In six of the eight countries surveyed, majorities say rising prices are a very important problem, a median of 65%. This includes an overwhelming 99% of Pakistanis. Only in Australia (39%) and Japan (36%) do people not consider inflation a major challenge and for good reason. In 2012, Australia experienced an inflation rate of just 1.8% and Japan has been experiencing deflation off and on since 1995. A median of 64% of people in the Asian/Pacific region complain about the lack of job opportunities, including 94% of Pakistanis and 84% of Filipinos. Only 28% of the Chinese fret about joblessness, possibly because the official unemployment rate in 2012 was only 4.1%. Roughly six-in-ten people in the region (median of 63%) worry that the public debt is a very big problem. Again it is Pakistanis (82%) and Filipinos (81%) who are the most concerned and the Chinese (13%) who are the least troubled. While roughly half of the publics in the Asian/Pacific region (median of 49%) express strong unease about the gap between the rich and the poor, such concern is the lowest among all the regions but North America. In four of the eight countries surveyed, less than half the public thinks inequality is a very big problem, including just 34% of the Japanese and 33% of the Australians. Nevertheless, majorities in seven of the eight countries think that the rich-poor gap has widened in the past five years. Such fears are particularly strong in Pakistan (83%). But only 32% of Malaysians think inequality in their society has worsened. 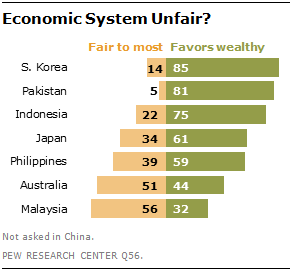 Overall, publics in the Asian/Pacific region (median of 61%) are among the least likely in the survey to say that the economic system generally favors the wealthy. In fact, 56% of Malaysians and 51% of Australians think that the economic system is fair to most people in their country. A median of 40% of publics in the Asian/Pacific region want their government to make a priority of fighting inflation. This is particularly important to people in Pakistan (68%) and China (53%). And, perhaps given Japan’s recent bout of falling prices, inflation fighting is a very low priority for the Japanese (9%). About half the Japanese (52%) prioritize job creation, as do 46% of Filipinos and 41% of Koreans. And about a quarter of the Chinese (26%) and South Koreans (24%) want their governments to work first on reducing the gap between the rich and the poor. In the past year, medians of less than a third of people in the region report having had trouble affording food, health care or clothing. But within the region is wide diversity in experience with such deprivation. A median of 24% say that there was a time over the past 12 months when they did not have enough money to buy the clothing needed by their family. But this ranges from 47% of Pakistanis to 3% of Japanese. A median of 28% in the region complain that they did not have the funds to pay for needed medical care in the last year. Again this ranges from 53% of Pakistanis to 3% of Japanese. And a median of just 20% say they did not have enough money to buy food, ranging from 48% of Pakistanis and Filipinos to 2% of Japanese. Latin Americans (a median of 40%) are among the most pleased with the direction of their country of the publics surveyed. This includes 44% of Brazilians and 43% of Chileans. And Latin Americans are also fairly satisfied with the state of their economy: a median of 44% among the seven countries surveyed think economic conditions are good. Again the Brazilians (59%) and Chileans (58%) are the happiest, suggesting a close link between people’s attitudes toward the economy and public sentiment about their country’s direction. Such sentiment also exposes differences between experience and public opinion. Brazil’s economy grew by only 0.9% in 2012, according to the International Monetary Fund. Chile’s grew by 5.5%. 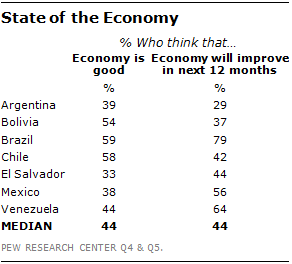 More than four-in-ten Latin Americans (median of 44%) think their economy will improve over the next 12 months. The range in such optimism across countries is quite large: 79% of Brazilians expect economic conditions to get better, but only 29% of Argentines agree. Along with the Chinese (80%), the Brazilians are the most upbeat about their economy’s future of any of the publics in the 39 nations surveyed. Latin Americans are generally positive about their personal finances. A median of 57% say they are good, including 74% of Brazilians. And a median of 57% among the publics surveyed think their family economic fortunes will improve over the next year. Again it is the Brazilians (88%) who are the most optimistic. Roughly half of Latin Americans (median of 51%) also think that children today in their country will be better off financially when they grow up than their parents. Brazilians (79%) and Chileans (76%) have the greatest expectations for kids’ future, while Argentines (44%), Mexicans (44%) and Salvadorans (40%) are not nearly so sure about prospects for the next generation. Rising prices are one of the top economic problems that concern Latin Americans, with a median of 84% saying inflation is a very big economic challenge. This includes 88% of Venezuelans and Salvadorans, 84% of Argentines and Chileans, and 83% of Brazilians and Mexicans. In 2012 the inflation rate was 10% in Argentina but only 3% in Chile. A similar percentage (median of 80%) cites a lack of job opportunities. A median of 69% also point to public debt. But when asked which issue their government should address first, a median of 46% of Latin Americans say jobs. Latin Americans are also concerned about inequality. A median of 68% say a very pressing economic issue facing their country is the gap between the rich and the poor. This includes 79% of Chileans but 58% of Bolivians. However, Latin Americans (a median of 50%) are the least likely among those surveyed to say that inequality has risen in the last five years. This includes just 32% of Bolivians, who, along with Malaysians (32%), are the least likely to think there has been a rise in the gap between the rich and the poor. Nevertheless, a median of 70% of Latin Americans think that the current economic system favors the wealthy, including 86% of Chileans. Notably, Bolivians (44%) and Venezuelans (32%) stand out as much less likely to say the economic system is unfair. Bolivians may be the least concerned about inequality in the region, but their lives are ones of deprivation. Fully 61% of Bolivians say that there have been times in the past year when they did not have enough money to buy food, 58% complain that there have been times when they could not afford medical and health care for their families, and 56% say there have been times when they could not pay for clothing. Many of the publics surveyed in Latin America report high levels of deprivation. Overall, a median of 44% describe an inability to afford medical treatment for their family, 45% say they could not buy clothing and 45% complain that they could not buy food for their families at some point over the past 12 months. A median of roughly three-in-ten (28%) of the six African countries surveyed are satisfied with how things are going in their country today, including just 12% of Nigerians. The most satisfied are the Kenyans (48%), but even then roughly half (51%) are dissatisfied. More say their economy is doing well (median of 46%). Among Africans, the most satisfied are South Africans (53%), whose economy grew by 2.5% in 2012 according to the International Monetary Fund, and Kenyans (52%), whose economy expanded by 4.7%. The Nigerians (32%) are the least content with the economic situation despite the fact that their economy grew by 6.3% in 2012. However, regardless of their relative dissatisfaction with current conditions, Africans (median of 60%) are the most likely to think that their economy will improve over the next 12 months. They are more than twice as optimistic as publics in the Middle East (28%) and more than three times as hopeful as people in Europe (19%). The most optimistic Africans are the Senegalese, of whom 69% think their economy will improve. 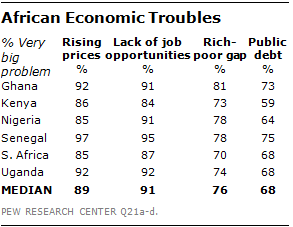 The most pessimistic are the South Africans and the Ugandans, 23% of whom believe economic conditions will worsen. Publics in Africa feel only marginally better – a median of 50% – about their personal finances than they do about their national economy. The Ghanaians (46%) and the Ugandans (43%) are the least satisfied. Notably, among the regional publics surveyed it is also the Africans (median of 68%) who are most likely to think that their personal financial situation will improve over the next year. However, Africans are less sure of the future for kids in their societies. A median of just 53% think that when children today in their country grow up they will be better off than their parents. 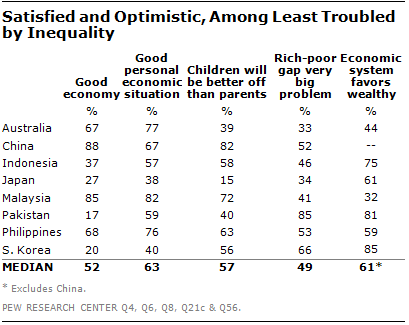 (People in the Asian/Pacific region – 57% – are slightly more optimistic about the next generation.) The most hopeful for today’s kids are the Ghanaians and the Nigerians (65% each). The least optimistic are South Africans and Ugandans (39% each). Among the regional groups surveyed, Africans are the most worried about jobs (a median of 91% say a lack of employment opportunities is a very big problem), one of the most troubled by inflation (89%) and the most upset about the gap between the rich and the poor (76%). The Senegalese are the most concerned about a lack of job opportunities (95%) and rising prices (97%). Ghanaians (81%) are the most upset about inequality. Africans are about as worried about public debt (median of 68%) as are Europeans (70%) and Latin Americans (69%), with the Senegalese (75%) being the most troubled. And Africans (47%) are clear; creating more jobs is their number one priority for government action. Concern about inequality is widespread in Africa. Roughly seven-in-ten Africans (median of 72%) think that the gap between the rich and the poor has increased in the past five years, including 80% of Kenyans and Nigerians. And a median of 78% think that the economic system generally favors the wealthy, a level of discontent with modern capitalism comparable to that in Europe. The greatest level of dissatisfaction is in Ghana, where 94% think the current system is unfair to most people. Deprivation – as measured by the inability to afford food, health care or clothing at some time over the previous 12 months – is pervasive in the six African nations surveyed. Medians of more than half report that they could not pay for medical attention (59%), clothes (57%) or food (56%) at some point in the past year. Ugandans in particular seem to be suffering, with 77% saying they experienced shortages of health care and 70% reporting that they could not afford food or clothing.